On Broadalbin Street, a nice place to sit and watch the cars go by. In case you haven’t noticed — and I hadn’t before Saturday — the downtown Albany “parklets” are back for the second summer in a row. The Albany Downtown Association thought of the idea last year and put it into action. The idea was to create small spaces on city streets for passersby to pause and take a load off. 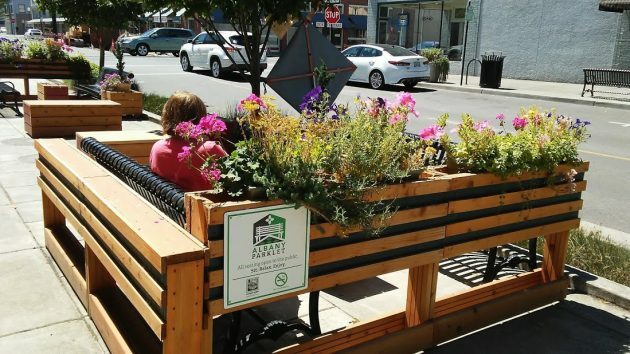 There are two of these parklets, one on Broadalbin Street and the other one a block away on First Avenue near the Wells Fargo Bank. Benches and flower baskets, that’s about all there is, along with boards and game pieces for checkers. If someone wanted to bring a set of chess men, that would be possible too. Not having staked out the scene and kept watch, I wondered how much use these little places were getting. Lise Grato of the Downtown Association told me that since the outdoor sitting areas were set up, which was done during “our spring cleanup,” she has often seen people playing checkers there. And now and then someone plays the guitar. Is it feasible to sublet these parklets to eager eclipse viewers. The City could rent the two spots out for the August 21st event for several thousand dollars. Might make a dent in the City’s coffers. I’d complain about these being a waste of taxpayer’s money but… I kind of like them. A nice way to relax and connect with friends. I wish there was shade to go with it! Thank you for providing this place of respite. We love these. We’ve stopped at the end of date night or with our girls on a walk to the farmers’ market after breakfast downtown. They’re such a simple thing, but so sweet. It would be nice to read about talk of adding a 3rd…maybe a 4th…so on …and on! Say…the north corner of this promenade that the Vault restaurant uses for dinner seating. Does the City get some rental money out of a commercial use of public space!!? ?